Eric P. Allen has a track record of success representing injury victims and disabled persons for over twenty years. Eric has been representing injured and disabled individuals since graduating from law school at the University of Toledo in 1987. As a skilled negotiator, Eric has achieved thousands of successful settlements for his clients. When settlements cannot be reached, Eric has aggressively litigated numerous cases to favorable jury verdicts. Eric has also won claims for Social Security Disability and SSI benefits for thousands of disabled persons since 1987. Eric is licensed to practice law in Ohio and Kentucky. 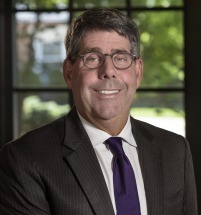 He is involved in the Ohio Association for Justice, American Association for Justice, N.O.S.S.C.R., and many local bar associations including the Cincinnati Bar Association. Eric has successfully argued in numerous appellate courts including the Sixth Circuit Court of Appeals. He has also argued before the Ohio Supreme Court. As a result of his experience, dedication, and success, Eric has been asked to speak about the law to various groups and has served on local legal panels. In his spare time, Eric enjoys spending time with his wife and three children.